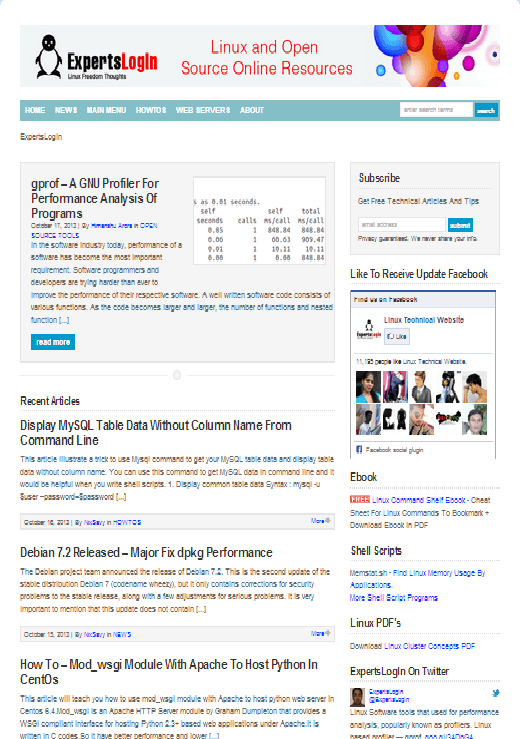 LinOxide is a blog platform where we publish howto articles and guides on Linux and Unix based distros. This portal will include tips & tricks, command line commands, opensource tools and server administration on FOSS (Free Open Source Software) technologies. It's a knowledge base where we share all the information we have learned from our experience for beginners and advanced users. Early in 2006 website was running in Punbb Forum named as "ExpertsLogin", a nice and lightweight forum. Then it is been changed to blog format in 2008. In 2013 we rebranded ExpertsLogin to a new name "LinOxide". Initially, the website was powered on Cpanel under a shared hosting company. Due to limitations with shared hosting, we moved to a cloud instance. Now our traffic is managed by a load balancer under Nginx webservers and with dedicated database servers. We also depend on CDN for faster website loading from edje locations. Hope this online technical website help our fellow readers all over the web to become a better Linux user. We really appreciate all our readers to provide us your feedback on our articles/website and also submit technical queries in the comment section the end of each article. We welcome all our readers to join our email subscription to receive free article in your mailbox. You can also join our social community pages by following us to know the latest technology trends in FOSS. Follow us on Google+, Twitter and Facebook and you are welcome to contact us and provide feedback.